The Silicon Valley Venture Capitalist Confidence Index™ (Bloomberg ticker symbol: SVVCCI) is based on a recurring quarterly survey of San Francisco Bay Area/Silicon Valley venture capitalists. The Index measures and reports the opinions of professional venture capitalists on their estimations of the highgrowth venture entrepreneurial environment in the San Francisco Bay Area over the next 6 – 18 months.1 The Silicon Valley Venture Capitalist Confidence Index™ for the second quarter of 2018, based on a June 2018 survey of 30 San Francisco Bay Area venture capitalists, registered 3.80 on a 5-point scale (with 5 indicating high confidence and 1 indicating low confidence). This quarter’s index measurement edged slightly higher from the previous quarter’s index reading of 3.76; and remained above its 14.5-year average of 3.71. Please see Graph 1 for trend data. Silicon Valley Venture Capitalists’ confidence in the Bay Area entrepreneurial environment edged higher for the third consecutive quarter in Q2 2018. Continued opportunities for disruptive technology and business model innovations, ample capital, and a steady exit environment supported confidence. While liquidity activity decreased from the previous quarter, it remained at healthy levels.2 Invested capital declined somewhat from the previous quarter, but remained well above the year earlier quarter although the number of deals declined.3 Still, concerns were raised over the rising costs of doing business in the Bay Area, especially relative to other regions of new venture creation. These rising costs of business were matched by rising valuations that may make eventual liquidity options less attractive. Macro uncertainties (e.g. international and domestic politics) also raised concerns and weighed on sentiment. Still, the attraction of new market opportunities being served by new technologies and models of business outweighed other contextual concerns for now. In the following, I provide all of the comments of the participating venture capitalist respondents along with my analysis. Additionally, all of the Index respondents’ names and firms are listed in Table 1, save those who provided their comments confidentially. In summary, confidence rose slightly in the second quarter of 2018 as venture capitalists, with abundant capital to fund many of the high potential new ventures launching and growing in the Bay Area, expected a better IPO and M&A market on the horizon. However, the Silicon Valley entrepreneurial ecosystem is showing signs of strain – largely emanating from its own success. Rising costs to business and the talent that drives those growth ventures continue to rise, making the region less attractive and more challenging to operate from. Meanwhile, high valuations may make attractive liquidity events more difficult to obtain and also attract the notice of government authorities that seek potential new sources of revenue. So, while the Silicon Valley innovation engine continues to percolate – identifying, growing, and enjoying the benefits of disruptive new ventures driven by Silicon Valley entrepreneurs, the stakes appear to be growing with the future more difficult to discern now than in less heady days. Mark V. Cannice, Ph.D. is Department Chair and Professor of Entrepreneurship and Innovation with the University of San Francisco School of Management. 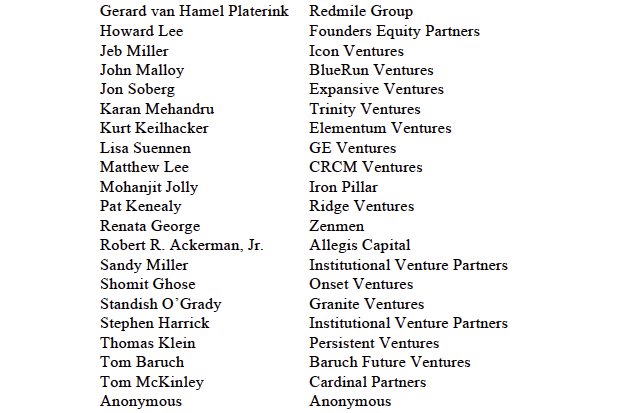 The author wishes to thank the participating venture capitalists who generously provided their expert commentary. Thanks also to James Cannice for his copy-edit assistance. 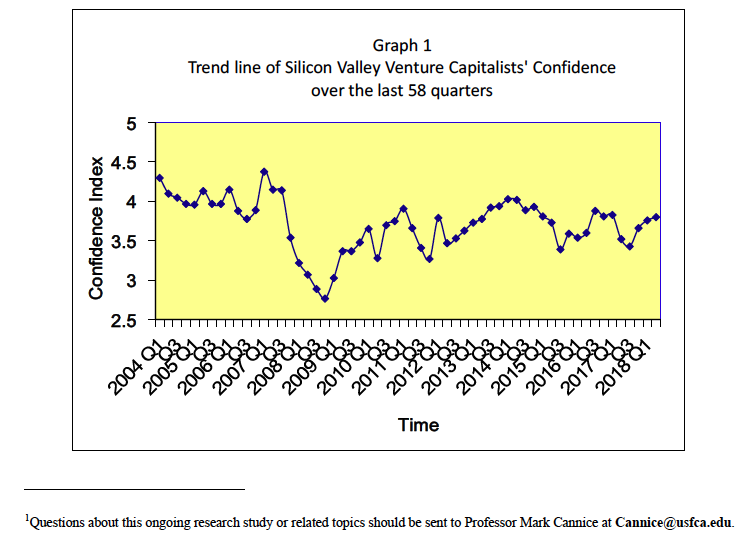 When citing the Index, please refer to it as: The Silicon Valley Venture Capitalist Confidence Index™, and include the associated Quarter/Year, as well as the name and title of the author. The Silicon Valley Venture Capitalist Confidence Index™ is a trademark of Mark V. Cannice. Copyright © 2004 – 2018: Mark V. Cannice, Ph.D. All rights reserved.